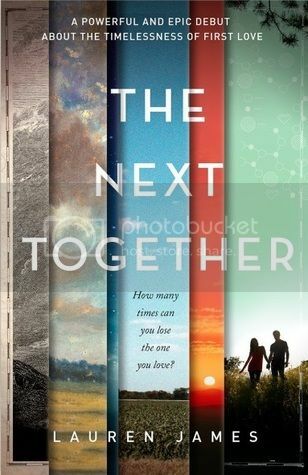 The Next Together by Lauren James (reading copy) - How many times can you lose the person you love? Maybe the next together will be different... From Goodreads. There aren't many YA novels on reincarnation that I've read, so when I heard that Lauren James' debut novel would be about reincarnation and science, I was desperate to read it. The Next Together is a unique story, and absolutely gripping - but a little disappointing. In 1745, Katherine Finchley, a well born woman, and Matthew Galloway, her coachman, fall in love while trying to help protect the city of Carlisle from a siege against the Jacobite rebels. In 1854, Katy is an orphan trying to get herself out of poverty by pretending to be a boy to get work. She is working for Matthew Galloway, journalist for The Times. Together, they are covering the Crimean wore on the front lines, and when Matthew discovers Katy is a girl, they slowly develop feelings for each other. In 2019, Matthew and Katherine Galloway are a married couple, biologists working for Central Science Laboratories. When they discover that their employers are trying to create a biological weapon and attempt to stop them, they are killed and accused of terrorism. In 2039, Kate Finchley an Matt Galloway are studying biology at the University of Nottingham. When they discover that they were both related to the terrorists Matthew and Katherine Galloway, they try to find out exactly what they discovered and what happened to them, falling in love along the way. What they don't know is that they are all the same two people, reincarnated time and again, destined to find each other and subtly change the world. I absolutely love how this story is told! In every chapter, we follow the story of all the Katherines and Matthews, jumping from timelines and geographic locations. We see them fall in love repeatedly, but each incarnation of the two is passionate about doing good and doing the right thing, and are incredibly brave in the risks they take to do so, no matter what year they're living in. We discover the story of Matthew and Katherine Galloway of 2019 through notes left on the fridge, comments made on social media, and articles online, as well as through the research of Kate and Matt in 2039. Those two timelines are the two most connected; Katherine was Kate's aunt and Matthew was Matt's uncle, neither believe what has been reported about the married couple, and are desperate to find out. Both having an understanding of biology helps as they understand exactly what they're relatives were doing. Snooping into something that got the 2019 couple killed is highly dangerous, and you're constantly on edge. But there's danger in every timeline; during the Siege of Carlise and the Crimean War, becoming a casualty is a very high risk. What's awesome is, as you're reading along, you're very much aware that you're not the only one following all these incarnations of the couple. Fairly often throughout the book, you will get what are almost commands put into a computer (does anyone remember DOS? You know the letters on the black screen? It's very similar to that). Their lives were being manipulated by those who were observing them. Each incarnation is some kind of an assignment, and there is an objective of each assignment, but one we, the readers, and the incarnations, know about. It was fascinating! What exactly are these people watching wanting all the Katherines and Matthews to do? Why are they so keen on keeping them alive? Why are they assignments? What is the objective? How is it possible that they are able to "reboot" the incarnations in new timelines? What's happening?! Oh my god, so gripping! I did have to suspend disbelief pretty early on, though. I found that, no matter year it was, all incarnations fell in love far too quickly and easily - especially as we don't get to know much about them in any year. The focus is on their relationship, and what's happening in that timeline, rather than on who these people are. Every incarnation of Matthew has an interest in farming. Every incarnation of Katherine is pretty humorous and is inclined to constantly take the mick out of Matthew. But other than that, we don't know much about them as people. I did find 2019 Matthew and Katherine to be the most interesting incarnations, because Katherine was just so funny! She really was hilarious, but we never actually meet her, as their whole story is told through notes on the fridge, etc. Those incarnations are the only ones that show much personality, because it comes through in their notes to each other. However, I would just let it go that I wouldn't really know the incarnations, and they were going to fall in love easily because they had already been in love with each other so many times before. I let it go, and just enjoyed the story for what it was, and spent most of the story feeling excited and eager to know what was going to happen next for all of them! But then we got to the end of the stories, for each incarnation, and I felt hugely let down. I can understand why some of the incarnations' stories ended the way they did - they kind of needed to for the sake of future incarnations, despite feeling unsatisfactory. But the ending to the whole book was so disappointing. We are told what happens, rather than get to actually see it. A decision is made, and then the prologue tells us, in a few pages, what happened as a result of that decision. I know there is going to be a sequel, and a lot of questions will be answered, but the things we are told about are huge! It would have been so much more satisfying to have read them as they happened, rather than be told after the fact. Sure, it would have made the story quite a bit longer, but I think it would have been worth it. The ending of The Next Together has got to be one of the biggest ending let downs I've ever read. I wasn't happy, and I felt cheated. Saying that, the book on the whole is incredible. It's so very easy to get completely drawn in and immerse yourself in the different stories happening in the one book. It's a fantastic combination of sci-fi, historical, mystery, romance and dystopian, and for the most part, it works brilliantly! I really am so eager to find out what will happen in the next book, The Last Beginning - I just hope it has a far better ending. Thank you to Walker Books for the reading copy.